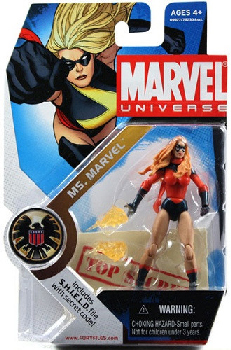 Description Of Item: Marvel Universe - Dark Avenger Ms Marvel Variant. The legends of the Marvel Universe got a little bit smaller! These pocket-size, 3 3/4-inch action figures include incredible articulation and amazing detail, and will be perfectly scaled with your other similarly sized toys. Marvelous mutants, superb superheroes, and venomous villains are all here! Classic characters in a collectible size!Heroes and villains from your favorite comics! Awesome articulation!